Paseo del Salón runs alongside the River Darro and is a fun and shady place to take a walk. The riverside gardens are located along the Paseo del Salón at the end of the Carrera del Genil, on the right bank of the river. 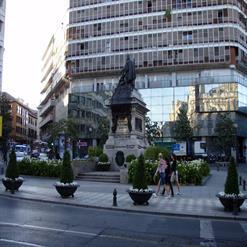 Throughout Jardines del Paseo del Salón y de la Bomba there are a total of eleven roundabouts with different architectural styles.